Apple iPhone 8 (RED) is made with glass with classy design for help to buy a mobile. iPhone 8 (RED) is a glass finishing Uni-Body metal design. The new RED Edition is very classic and stylish mobile. 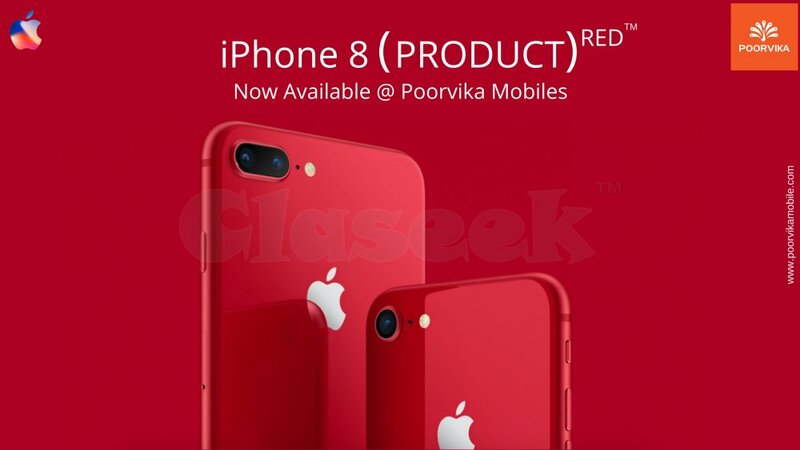 Apple iPhone 8 & 8 Plus (RED) Edition available on Poorvika Mobiles, (Buy (RED). Give life.) For 11 years, Apple partnership with (RED) has supported HIV/AIDS programmes that provide counselling, testing and medicine that prevents the transmission of HIV from a mother to her unborn child. Apple Mobile Phones Price List in India at Poorvika Mobiles. Poorvika Mobiles have an exclusive apple store (SHINE) and also have apple website. Claseek™ India is a FREE online classifieds portal. You can buy, sell, trade, rent, deal, find and advertise almost anything here. We are one of the leading local classifieds for Real Estate, Electronics, Fashion, Vehicles, Services, Travel, Money, Jobs and more. Electronics section is dedicated for buying or selling electronic items like Digital camera, SLR camera, CD/DVD, Computer, Laptop, Tablet, PDA/Smartphone, Mobile phone, TV, CCTV, Videocam, Video game, etc. Buy from individual owners or shops.